Having spent the last two weeks in my native state of Minnesota, I was reminded of just how cold, cold can be, so cold, in fact, that I was inspired to design the ultimate of neck warmers, this Quilted Keyhole Scarf! Made in layers of Lanecardate’s incredible Lana Cotta Canberra and Quilter’s Dream’s lofty Dream Wool batting, my Quilted Keyhole Scarf is warm enough to withstand the coldest of cold days (even by Minnesota standards!) and cozy enough that you’ll look for reasons to wear it… and maybe never take it off! The Lana Cotta fabric has no clear right or wrong side, though the two sides are slightly different. Before starting, chose which side you prefer and use this as the “right side” throughout the pattern. 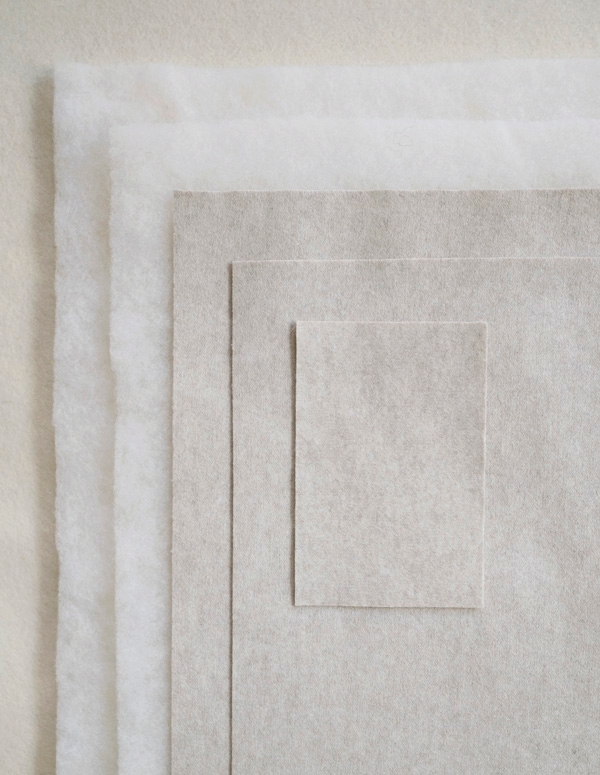 In our instructional photographs, we used thread in a contrast color to clearly show the steps for all of the hand-stitching techniques. You may want to use thread in a coordinating color. Cut two 11 by 49-inch pieces from both the batting and the fabric. 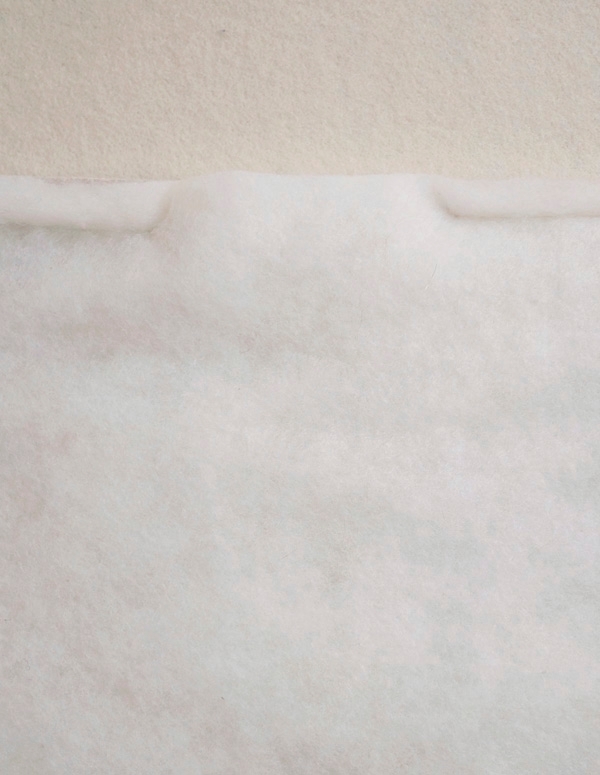 From the fabric also cut one 4 ½ by 3–inch piece. You will have five pieces total. 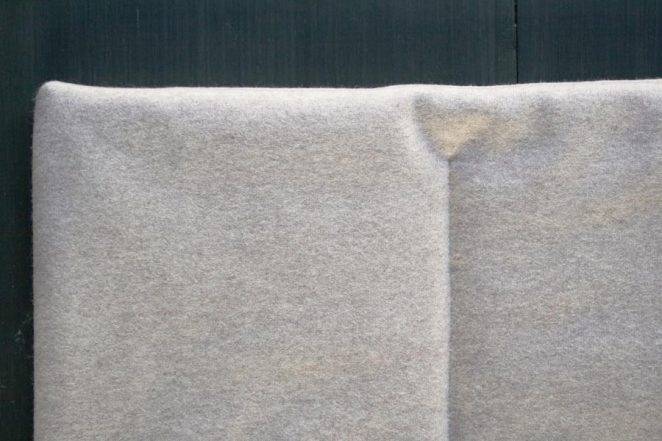 With the right side facing up, lay one of the large fabric rectangle pieces out on a clean surface and smooth it out so that there are no wrinkles. With the wrong side facing up, stack the matching fabric piece on top. Line up all the edges and smooth out any wrinkles. Now, stack the two batting pieces on top of the fabric pieces. Again, line up all the edges and smooth out the wrinkles. 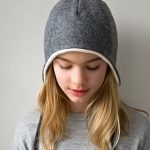 You will now have a stack of four pieces with two pieces of fabric on the bottom and two pieces of batting on the top. 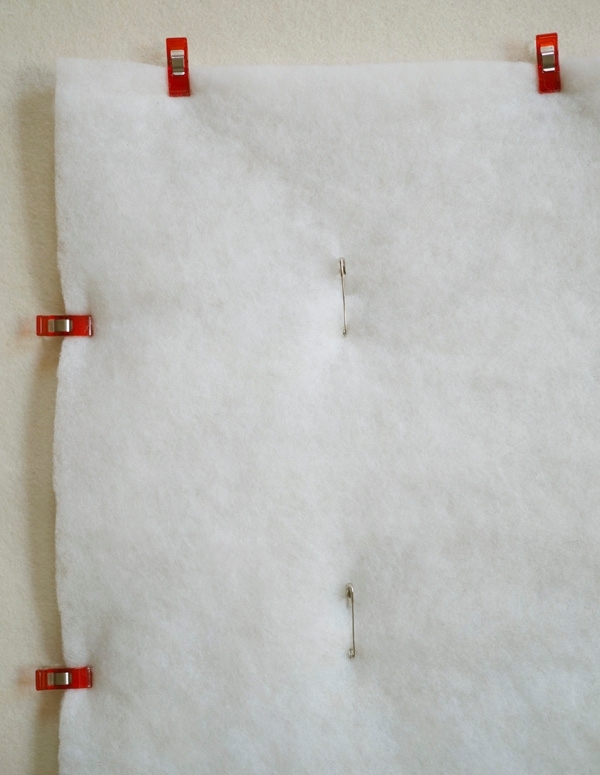 Using the curved safety pins, pin the 4 layers together, placing the pins every 5 inches down the center of the stack. Use the Wonder Clips to hold the edges of the stack together around all four sides. 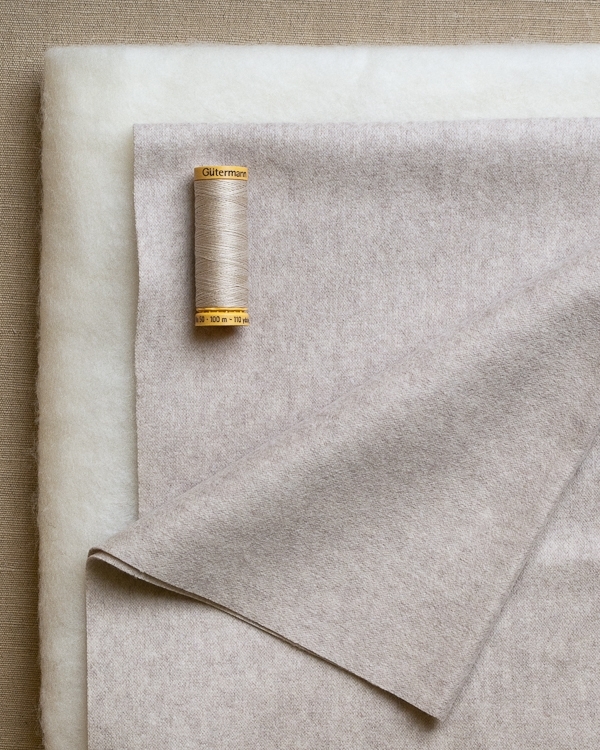 With the fabric at the bottom of the stack and using your machine’s walking foot, start in the middle of one of the long sides and sew around the edge of the rectangle with a ½-inch seam allowance. (Remove the Wonder Clips as you work). Stop about 5 inches from where you started the seam, leaving an unsewn gap. Flip the stack over so that the fabric is now at the top and the batting is on the bottom. 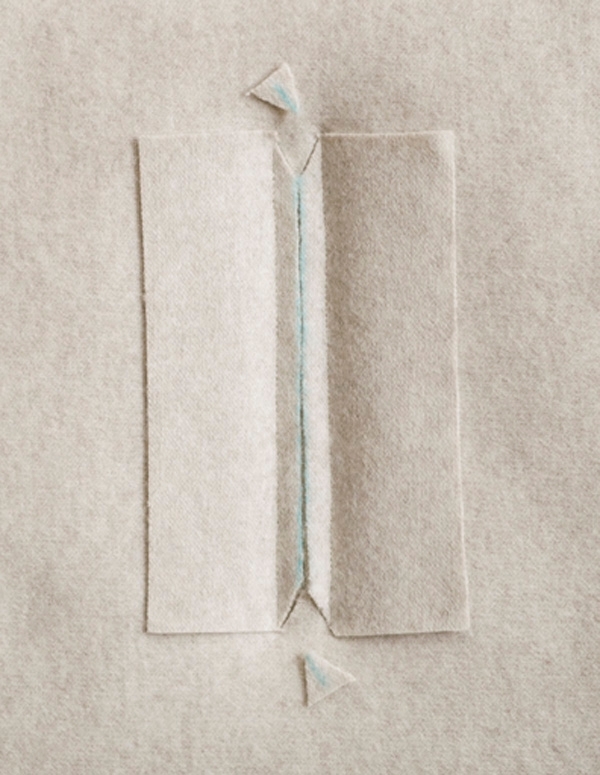 Use the fabric marker to make a small mark on the fabric in one corner, ½ inch in from where the two seams intersect. 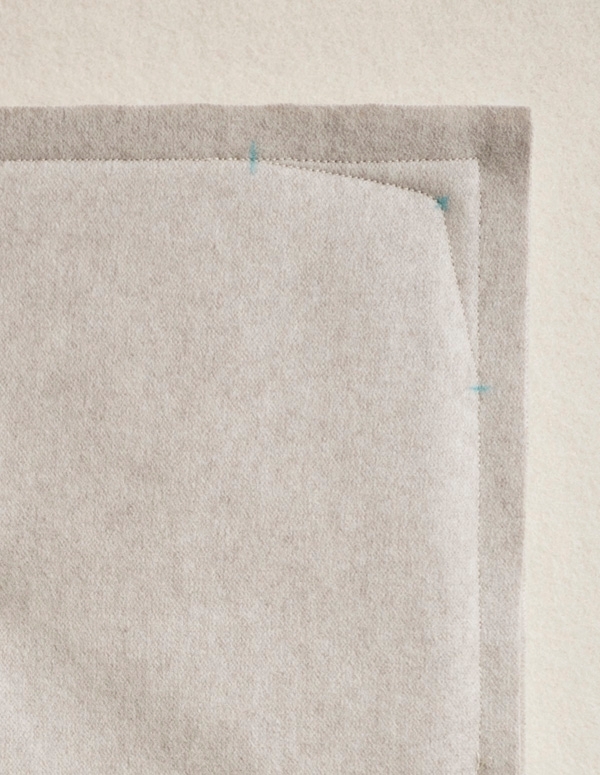 Now, make two small marks on the two perpendicular seam lines, each 2 inches from the corner. Working towards the corner, start sewing along one of the seam lines about ½ inch before the mark. When you reach the mark on the seam line, start sewing in a diagonal line, working towards the corner mark. 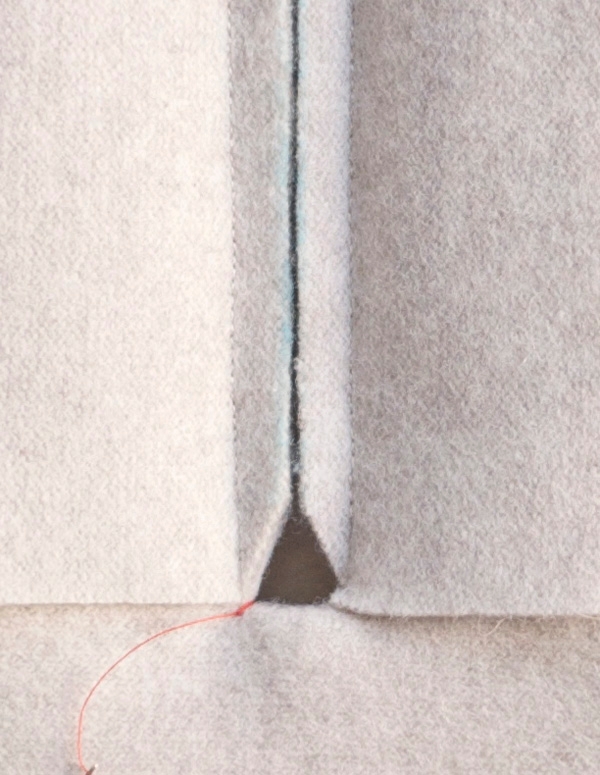 Once you reach the corner mark, pivot the stack and sew toward the mark on the other seam line. 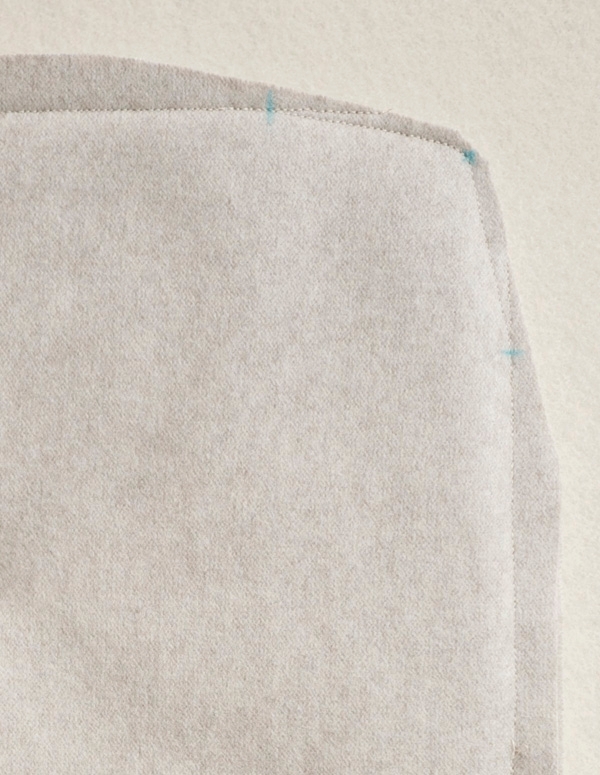 Once you reach the mark, continue to sew along the seam line for another ½ inch. Turn the scarf right sides out through the unsewn gap. The right sides of both fabric pieces will be facing out and the two layers of batting will be on the inside. Poke the corners out. 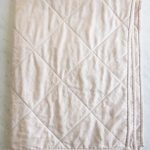 Fold in the raw edges along the gap and sew the gap closed with a ladder stitch. Here’s how . . . 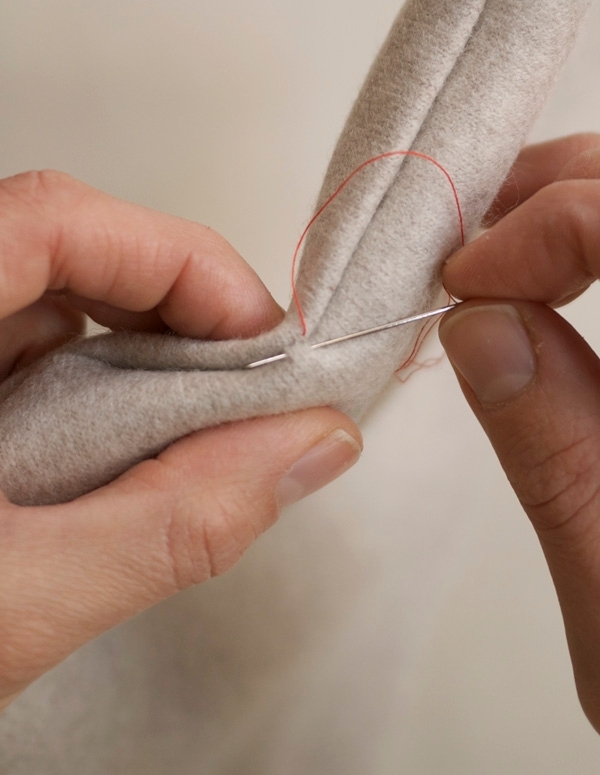 Pull the needle from the wrong side to the right side of the hem’s fold so that the thread’s knot is hidden. Insert the needle directly across from the first exit point and push the needle along the opposite fold, picking up about 1/8 inch of fabric. Go back and forth like this, sewing through the folds until you reach the end of the gap. Tie a knot at the end. 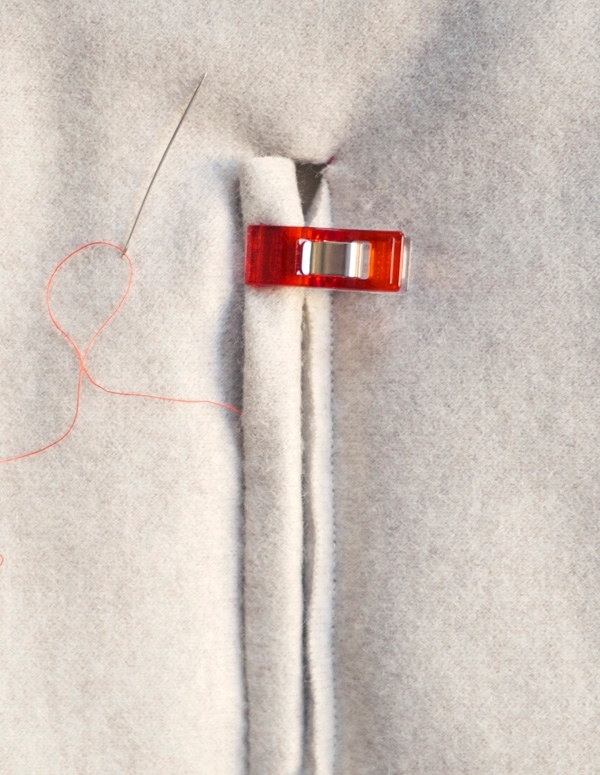 Pull the thread through the scarf and snip it at the exit point to hide the end. Use the wool setting to gently iron the scarf so that there are no major wrinkles and the seams are flat. 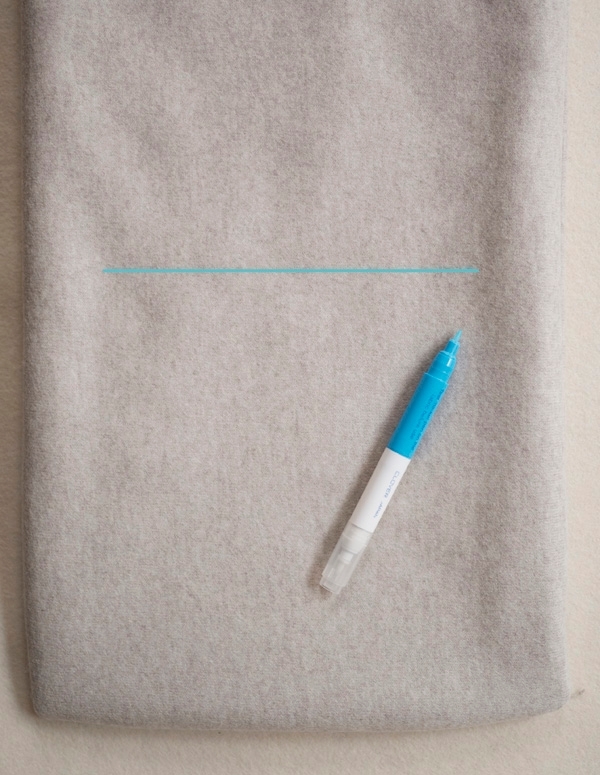 Use the fabric marker to draw a 6 ¼-inch line that is 8 inches in from and parallel to one short edge and that is centered between the two long edges. Make a second 6 ¼-inch line 8 inches from the first in the same manner. 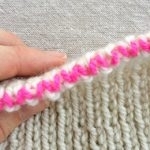 Repeat until you have 5 lines, the final one 8 inches from the opposite end of the scarf. Sew along the marked lines to quilt the scarf together. Here’s how . 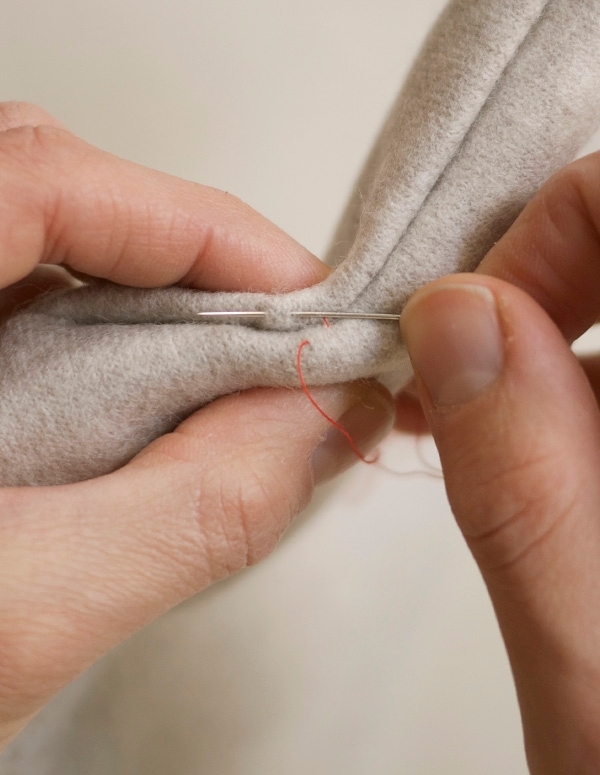 . .
With your machine’s walking foot still attached, start with the middle line and,begin the seam with a very, very small stitch length for ½ inch. (This avoids having to backstitch to secure the line of sewing.) 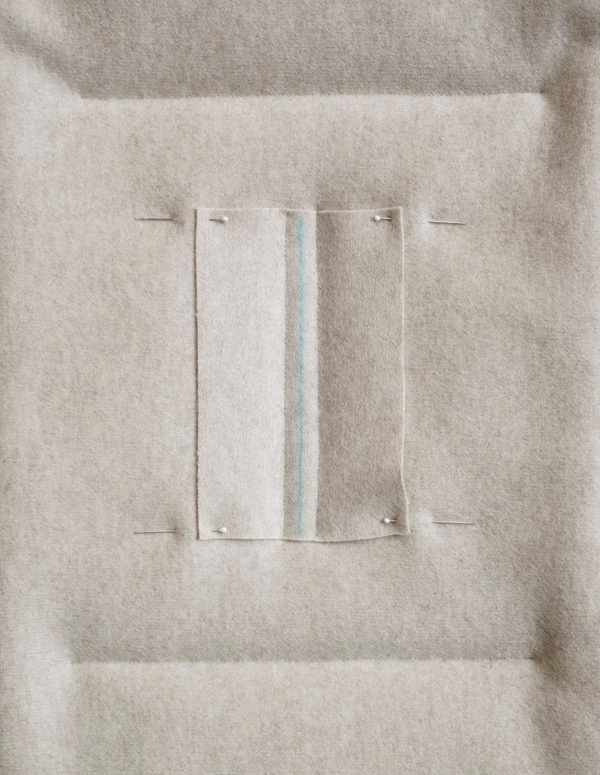 Then with a regular stitch length, continue to sew along the line until you are ½ inch from the opposite end. 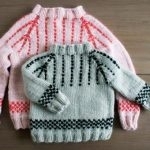 Switch to the small stitch length again and sew until you reach the end of the line. To sew the next line pick up your foot and needle but do not cut the thread. 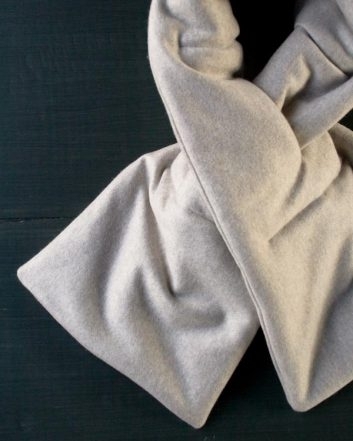 Rotate the scarf 180 degrees and then sew along the line to the left of the previously sewn line in the same manner, with the ½ inch of small stitching at the beginning and end. Make sure to start and stop exactly at the end of the marked line. Continue to sew along all of the marked lines in the same manner. The scarf is now divided into 6 sections by 5 stitched lines. Clip off all the lengths of thread connecting the beginning and end of each line. Trim them off right at the end of the stitch lines. 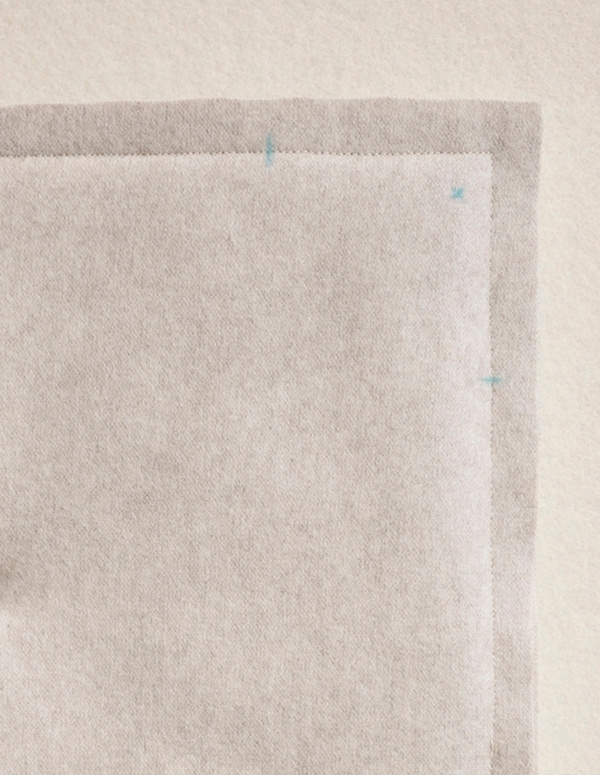 Use water or the “eraser” end of the fabric marker to remove all marked lines. With the wrong side facing up and the 3-inch sides running along the top and bottom, lay the small fabric rectangle out flat. Use the fabric marker to make a straight line vertically down the center of the rectangle. Lay the scarf out flat. Place the fabric rectangle on top of the scarf so that it is centered in the second section in from one short edge (between the first and second stitched lines) and the marked line runs parallel with the scarf’s long side edges. Pin the fabric piece in place. 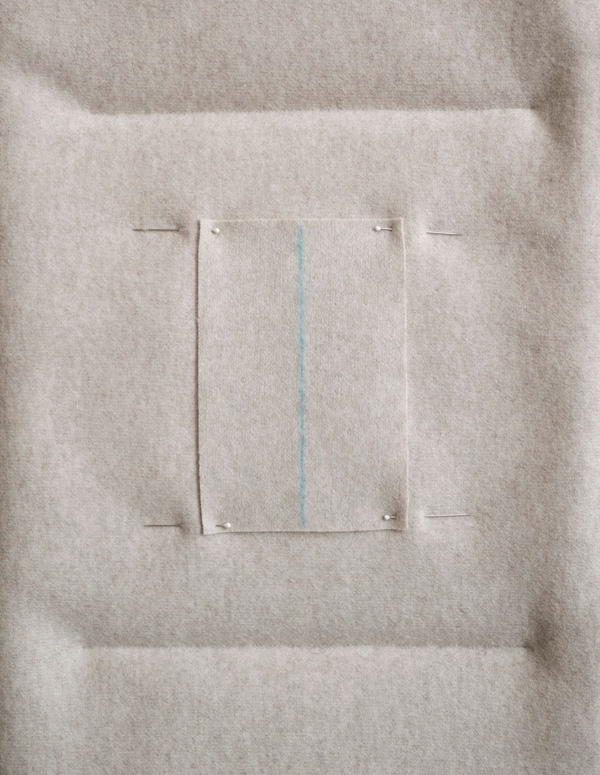 Sew a seam ¼ inch from each side of the marked line of the fabric rectangle. 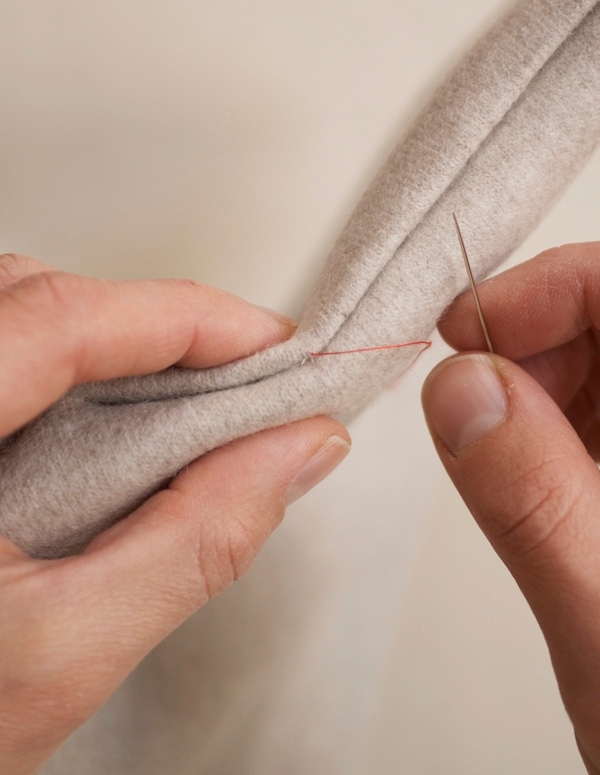 Begin and end the seam with a very small stitch, as described above, and be careful not to sew past the edge of the small fabric piece. Make diagonal cuts from where the ends of the seam lines to the marked line. Make a straight cut along the marked line. 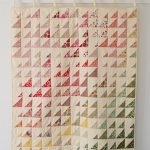 Remove the small triangles at each end of the small fabric piece. Push the remaining small triangle flaps at one end of the cut line into the inside of the scarf. Now stitch the folded edge of one wool triangle to the folded edge of the other wool triangle. Here’s how . . .
Push the needle up from between the layers of the scarf through to the front, exiting about 1/8 inch in from one end of the gap. Stitch in place 3 or 4 times by wrapping the thread around the edge of the fabric and pushing the needle back up through all of the layers of fabric and batting. 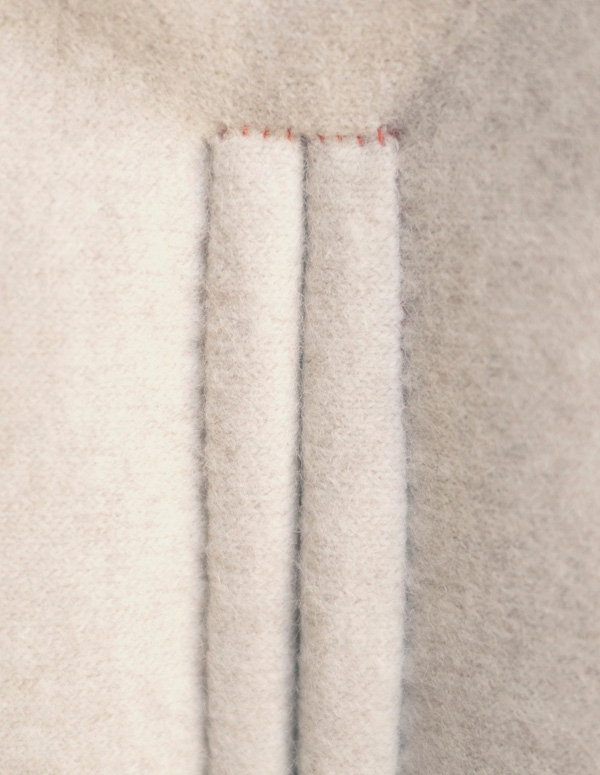 Next, sew the two wool flaps together with a ladder stitch, as described above. Finish by stitching in place 3 or 4 times on the opposite end of the gap. Tie a knot at the end. Repeat on the other end of the cut line. Now, flip the scarf over so that the fabric piece is on the back. Pull one loose flap of the small fabric piece through the keyhole, wrapping the fabric around the raw edge of the cut keyhole. Fold the long raw edge of the fabric piece under toward the wrong side, making a fold in the fabric piece that lines up with the seam line on the keyhole. You may want to use the Wonder Clips to hold the fold in place. Sew the fold of the fabric to the scarf with a ladder stitch, as described above. Repeat on the other side of the keyhole with the other loose flap of the small fabric piece. Sew the short raw edges of the folded fabric pieces to the scarf using a series of small stitches. Tie a knot at the end. Bonjour, j adore vos modèles mais je suis française…serait il possible d en avoir les traductions ? Merci et à très bientôt. Thank you for getting in touch and sorry we can’t be of more help! I’m going to try this and see h own I do. is missing at least one picture. as there are 2 triangles, at opposite edges of the hole; please have a few more pictures in there (or at least more text!) to clarify. I’m sorry you’re having trouble with this step! I’m not sure I completely understand the issue you’re having, but I think the description below may help. 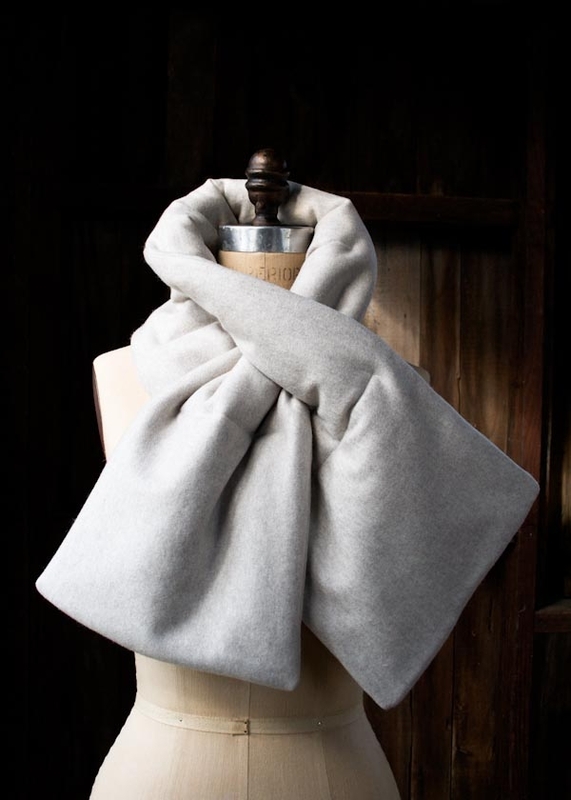 At each end of the cut slit there are two triangular flaps: one on the scarf front and one on the scarf back. 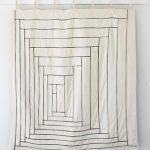 Both of the flaps on each side get folded into the scarf, making two small folded edges that run parallel to each other, and an open triangular space as illustrated in the fourth photo of the “Make the Keyhole” section. 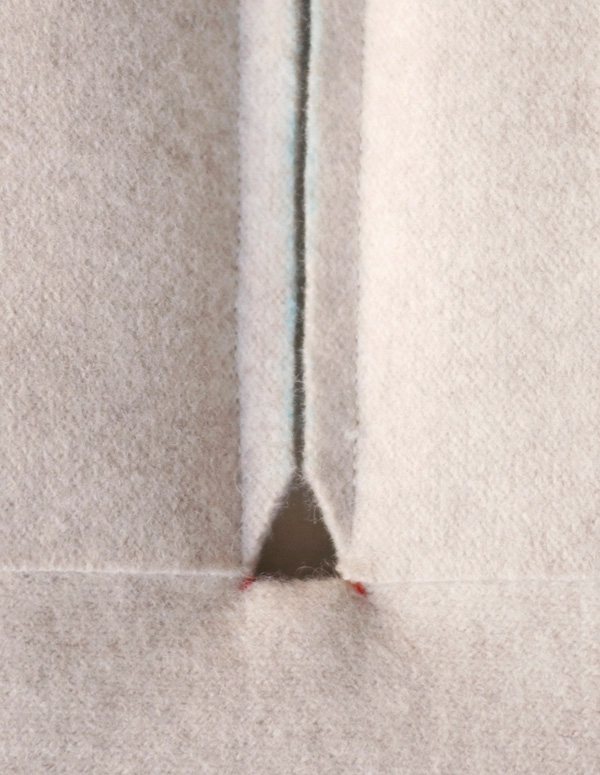 The folded edges of these two small triangular flaps get sewn together as described in the text. Once you have finished on one side of the slit, you repeat these steps with the two triangular flaps on the other side of the slit. Because the space that these small triangles make is so small, it is difficult to get an additional photo showing the folded edges that is clear enough to be of help. Believe me – I tried! Hopefully the additional description above will help. 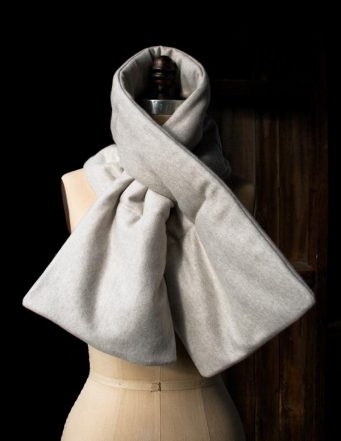 love this scarf – so elegant. This is one of the most stunningly beautiful and useful accessories I have ever seen….I simply can’t wait to make it! Thank you! Bonjour, comme Edith je suis française et j’aime beaucoup vos idées. Ce serait super si vous pouviez faire une traduction en français. Mon niveau d’anglais plus google traduction ne sont pas toujours suffisants ….!! Bravo et merci pour vos partages, dommage d’être si loin de vous !! 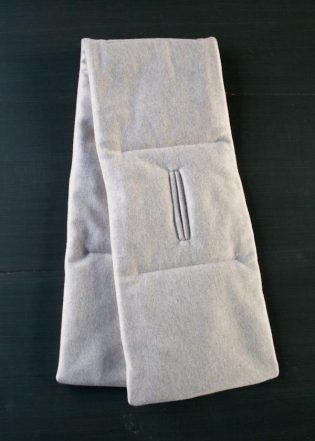 Can you please show us what the back of the scarf looks like when you are sewing the keyhole? I don’t understand the description and I am a visual learner. This is like a double welt pocket opening where both sides should look pretty, right? Does any of this help clear up the questions you have? Hello! 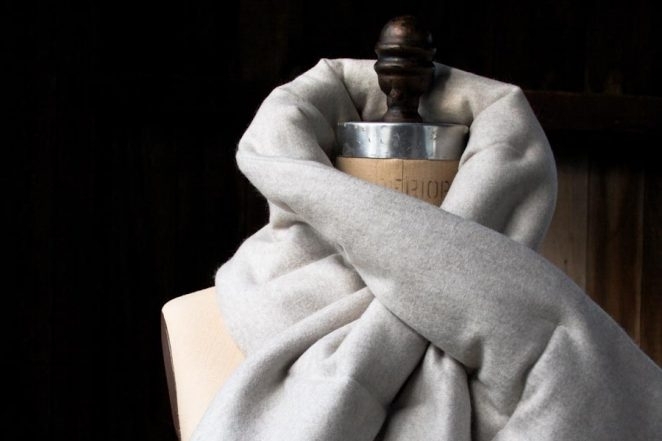 I saved this link years ago and I’m thinking of making a few of these scarves this winter for myself and a few (lucky!) friends. However, it appears that the Lana Cotta Canberra is no longer available…? If that’s indeed the case, do you have suggestions for other fabrics I might use? Thanks for writing in! It is true that we no longer carry the lovely fabric we used here. We do have an alternate wool yardage that could work well here. 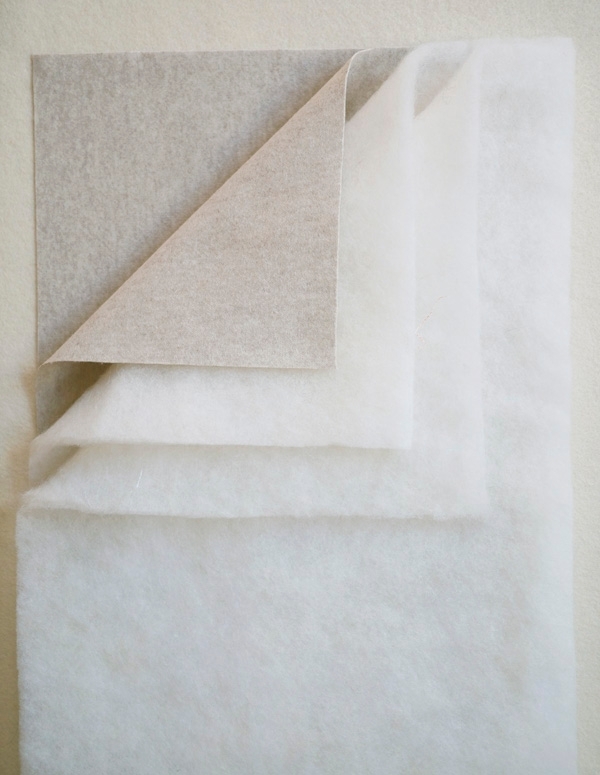 Dorr Mill’s Wool yardage is a bit more rustic but quite lovely in its own right!